A bunker for Bauhaus: design school comes home to Weimar - "The Bauhaus was born in Weimar, but was forced to flee the conservative city. Now it’s back with a centenary museum - as Germany’s far right rises again." Bauhaus - German art school operational from 1919 to 1933 that combined crafts and the fine arts, and was famous for the approach to design that it publicized and taught. COROFLOT - "A World of Creative Work." The largest, most established, most diverse pool of professional creative portfolios in the world. Since going live in 1998, Coroflot has grown to host over 1.4 million images of creative work, from the portfolios of over 150,000 creative professionals and students from nearly every country on earth. Coroflot users are industrial, graphic, fashion, interior, textile and interaction designers; 3D modeling and rendering specialists; architects, illustrators, art directors, design managers, and dozens of other disciplines. ELECTROLUX DESIGN - "The Electrolux design philosophy is called Human Touch. It’s about designing innovative, intuitive and desirable products that are seamlessly a part of our consumers’ daily lives." INDEX AWARD - since 2002. "Design to Improve Life is a Danish NPO with global reach. We Inspire, Educate and Engage in designing sustainable solutions to global challenges." KISS PRINCIPLE - acronym for: "Keep it simple, Stupid!" The KISS principle states that most systems work best if they are kept simple rather than made complicated; therefore simplicity should be a key goal in design, and that unnecessary complexity should be avoided. loewe craft prize - since 2016. "Award for excellence in craft and design." Rams' ten principles to "good design" - German industrial designer and retired academic closely associated with the consumer products company Braun and the functionalist school of industrial design. Rebel with a cause: how the founder of Bauhaus changed the world - "From Richard Rogers to Habitat and Ikea, the influence of the Bauhaus school is everywhere. So why is its charismatic founder, Walter Gropius, still so widely misunderstood?" The MAYA Principle - "Design for the Future, but Balance it with Your Users’ Present." Where Apple got its design from - "Dieter Rams: The legendary designer who influenced Apple." YANKO DESIGN - since 2002. "Modern Industrial Design News. Web magazine dedicated to introducing the best modern international design, covering from industrial design, concepts, technology, interior design, architecture, exhibition and fashion. It’s about the cutting edge and the classic, the new and the rediscovered. It’s all about the best." Yves BÉhar Is The Most Influential Industrial Designer In The World - Forbes. ALVAR AALTO - (1898-1976). Finnish architect & designer. His work includes architecture, furniture, textiles and glassware, as well as sculptures and paintings, though he never regarded himself as an artist, seeing painting and sculpture as "branches of the tree whose trunk is architecture." ARNE JACOBSEN - (1902-1971). Danish architect & designer. He is remembered for his contribution to architectural Functionalism as well as for the worldwide success he enjoyed with simple but effective chair designs. BØRGE MOGENSEN - (1914-1972). One of the most influential designers in shaping Danish Modern design. CHARLES & RAY EAMES - Charles Ormond Eames, Jr (1907–1978) & Bernice Alexandra "Ray" (née Kaiser) Eames (1912–1988) were American designers, who worked in and made major contributions to modern architecture and furniture. They also worked in the fields of industrial and graphic design, fine art and film. Charlotte Perriand - (1903-1999). "The extension of the art of dwelling is the art of living." French architect and designer. Her work aimed to create functional living spaces in the belief that better design helps in creating a better society. DIETER RAMS - German industrial designer & retired academic closely associated with the consumer products company Braun and the functionalist school of industrial design. His unobtrusive approach and belief in "less but better" design generated a timeless quality in his products and have influenced the design of many products, which also secured Rams worldwide recognition and appreciation. 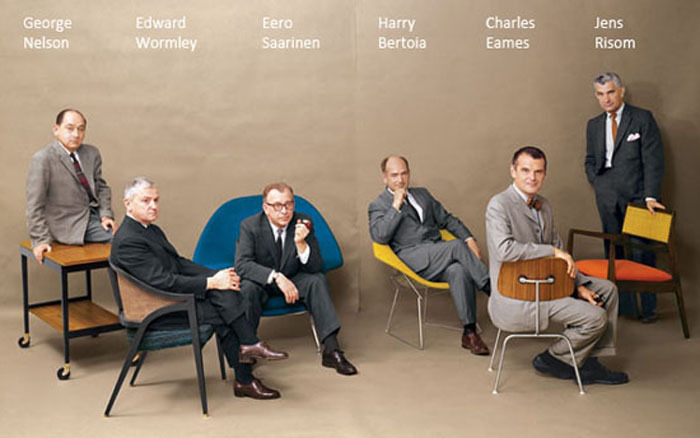 Eero Saarinen - (1910-1961). Finnish American architect & industrial designer noted for his neo-futuristic style. Saarinen is known for designing the Washington Dulles International Airport outside Washington, D.C., the TWA Flight Center in New York City, and the Gateway Arch in St. Louis, Missouri. Ettore Sottsass - (1917-2007). Italian architect & designer during the 20th century. His body of work included furniture, jewelry, glass, lighting, home objects and office machine design, as well as many buildings and interiors. Finn Juhl - (1912-1989). Danish architect, interior & industrial designer, most known for his furniture design. He was one of the leading figures in the creation of "Danish design" in the 1940s and he was the designer who introduced Danish Modern to America. Frank Lloyd Wright - (1867-1959). American architect, interior designer, writer & educator. Hans J. Wegner - (1914-2007). Cabinet-maker & furniture designer and one of the principals of 'Danish Modern'. He is one of the Danish designers who has achieved world fame. ISAMU NOGUCHI - (1904-1988). Japanese American artist and landscape architect whose artistic career spanned six decades, from the 1920s onward. Known for his sculpture and public works, Noguchi also designed stage sets for various Martha Graham productions, and several mass-produced lamps and furniture pieces, some of which are still manufactured and sold. JACOB JENSEN - (1926-2015). Jacob Jensen was among the last great Danish designers belonging to the golden era of the 1950s known as Danish Modern. He was the first Dane to train as an industrial designer and is considered a pioneer in Danish corporate history est known for his work with Bang & Olufsen. JASON PHILLIPS DESIGN - "Urban sophistication." American furniture designer. Jonathan Ive - English designer and the Senior Vice President of Design at Apple Inc. He is the designer of many of Apple's products, including the MacBook Pro, iMac, MacBook Air, iPod, iPod Touch, iPhone, iPad, iPad Mini & iOS 7. LE CORBUSIER - (1887-1965). Swiss-French architect, designer, painter, urban planner, writer, and one of the pioneers of what is now called modern architecture. He was born in Switzerland and became a French citizen in 1930. His career spanned five decades, and he designed buildings in Europe, Japan, India, and North and South America. LUDWIG MIES VAN DER ROHE - (1886-1969). "Less is more." German-American architect. Mies sought to establish a new architectural style that could represent modern times just as Classical and Gothic did for their own eras. He created a new twentieth-century architectural style, stated with extreme clarity and simplicity. His mature buildings made use of modern materials such as industrial steel and plate glass to define interior spaces. Along with Le Corbusier, Walter Gropius and Frank Lloyd Wright, he is regarded as one of the pioneers of modernist architecture. PHILIPPE STARCK - French product designer & interior designer. He is equally well-known as an interior designer, a designer of consumer goods, and for his industrial design. PIET HEIN - (1905-1996). Danish poet, mathematician & designer of the Super-Elliptic table series. POUL KJÆRHOLM - (1929-1980). The Danish furniture designer Poul Kjaerholm ranks with Arne Jacobsen, Poul Henningsen, Verner Panton, and Hans Wegner as one of the leading exponents of the legendary Danish design. RAYMOND LOEWY - (1893-1986). Franco–American industrial designer who achieved fame for the magnitude of his design efforts across a variety of industries. Among his designs were the Shell, Exxon, TWA and the former BP logos, the Greyhound Scenicruiser bus, Coca-Cola vending machines, the Lucky Strike package, Coldspot refrigerators, the Studebaker Avanti and Champion, and the Air Force One livery. TERENCE CONRAD English designer, restaurateur, retailer and writer. He has written over 50 books that broadly reflect his design philosophy, selling over 25 million copies worldwide. WALTER GROPIUS - (1883-1969). German architect and founder of the Bauhaus School, who, along with Ludwig Mies van der Rohe, Le Corbusier & Frank Lloyd Wright, is widely regarded as one of the pioneering masters of modernist architecture.